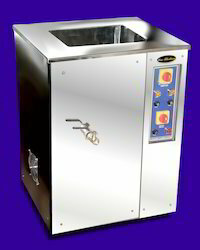 Our product range includes a wide range of ultrasonic jewelry cleaning machine 9 ltrs. In line with clients' variegated requirements, we bring forth a distinguished collection of the Stainless Steel Jewelry Cleaning Machine. These cleaners can remove the stubborn stains and tough spots, which are not removable by other products. Our offered product is highly durable and efficient. These are manufactured under the supervision of our experienced professionals.